Raku was traditionally a Japanese form of firing pottery associated with the tea ceremony. 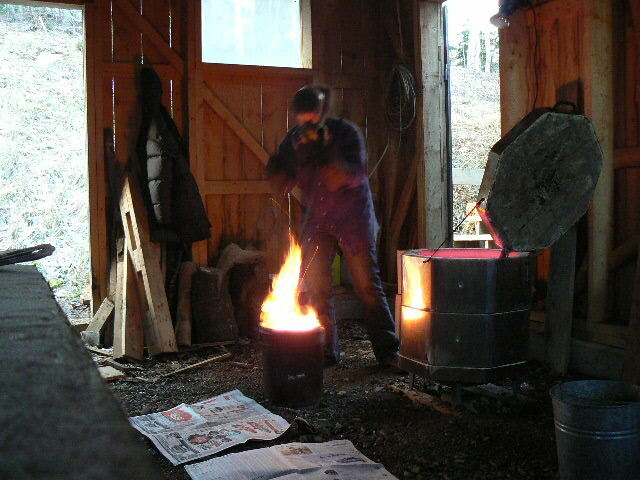 There are so many ideas of what traditional Raku actually is that I won’t attempt to define it here. Check out Wikipedia’s definition, or if you really want to get into it, Paul Soldner’s writings are interesting too. He’s one of the Godfathers of Western Style Raku which is different than Japanese (you’ll know that if you went to the above links, but don’t worry if you don’t feel like it, you’ll get the idea pretty soon) and I’m going to tell you about how I approach the process. 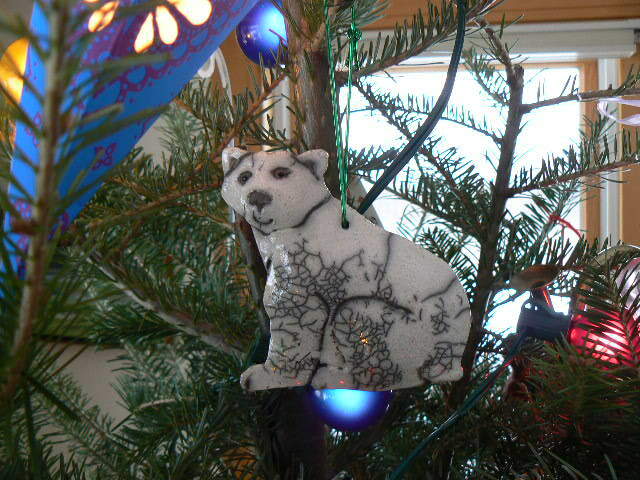 For the purposes of this intro to how I do Raku I’m going to walk you through the making of a Polar Bear Christmas tree ornament. (They’re new this year and I was firing some a few days ago to give as christmas presents so I took pictures of the glazing and firing process) This is pretty much how I make most of my “flat” pieces. 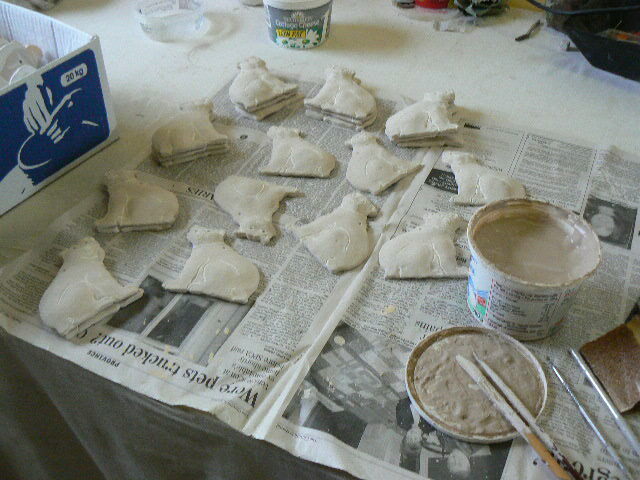 Once it has cooled off I unpack the kiln and the bears are ready to be glazed. For the bears I use a clear crackle glaze which I mix up myself, basically the way you’d make a cake batter from scratch, weighing out the different ingredients, while wearing a respirator!! I paint the glaze onto the bear, avoiding the lines that I drew on before it was fired. These lines will turn black in the firing and will outline the legs etc. The bear is then ready to be fired. I have two kilns that I use for doing my raku firings. One is electric and one is a modified garbage can which fires with propane. 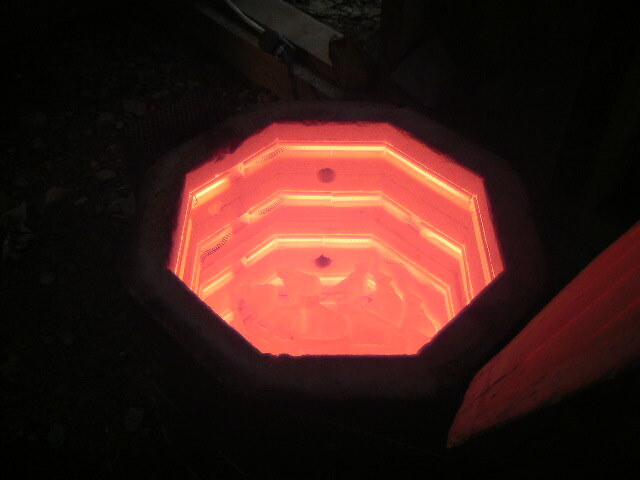 In the pictures that I have right now you’ll see the electric kiln in use. 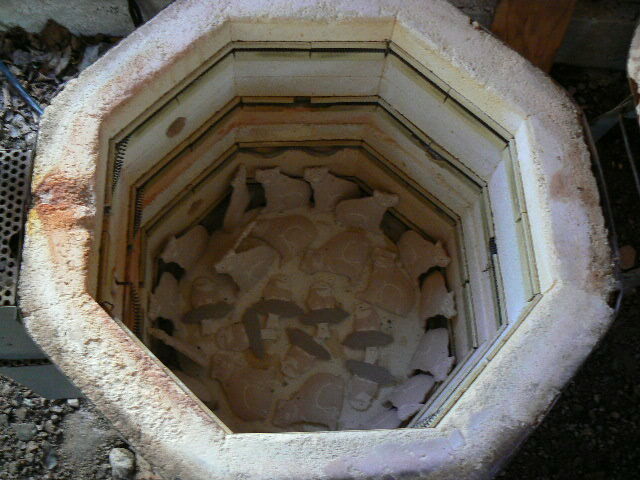 The electric kiln takes about 2.5 hours to get up to temperature and is great for larger pieces because it is a nice slow firing which reduces the shock to the clay that you can get in a rapid firing. I use the gas kiln for smaller, thinner pieces that are glazed with more colourful glazes. That kiln can be fired in as little as 10 minutes! 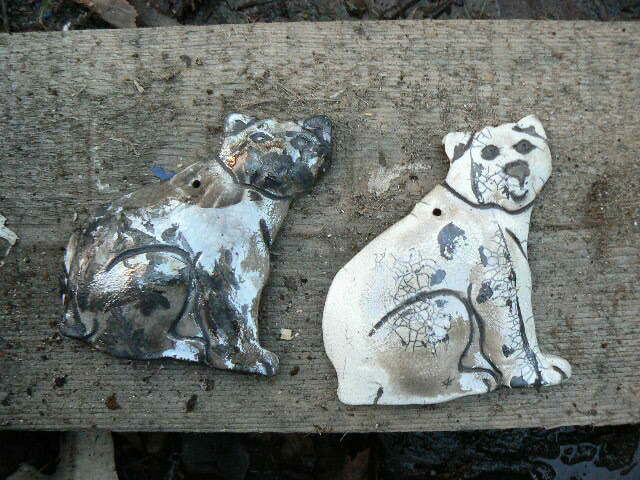 I find that the clear crackle glaze looks really nice when fired in the electric kiln, so I used it for the bears. I place about 20-25 bears in the kiln and turn it on high. I can check on the firing by looking through one of the peepholes on the side of the kiln. When the glaze looks really shiny and wet they are ready to take out. I TURN OFF THE POWER TO THE KILN (that’s important, since I’m taking the pieces out with metal tongs…ZAP!) and open the lid. I stand back for about 30 second, letting a lot of the heat out and then I take the bears out with tongs, one at a time. I hold them in the air for a little bit to let the glaze crackle in the cool air, and drop them into either a metal container with newspaper in it or face-down onto a flat piece of newspaper on the ground. You’ll see in the picture I’m wearing gloves and a respirator. The gloves are important because its so hot. The respirator is a life-saver, literally!! For the first few years that I did this I didn’t use a mask and would be coughing and blowing my nose for a few days after firing. Not to mention a wicked headache the day of. Safety precautions are SO important! 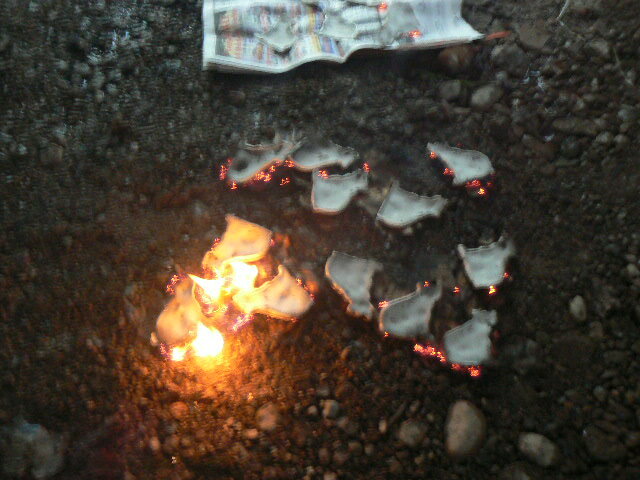 The bears are so hot they ignite the newspaper and it smokes, blackening the crackle lines and also those lines that I didn’t glaze. Bears after being placed on newspaper. I put a lid on the container, or place more newspaper on top to get a bit more smoke. If I am doing another firing I’ll put more pieces in the kiln now. After waiting for a bit for the bears to cool off, maybe 10 minutes, I then pull them out of the newspaper or open the container. 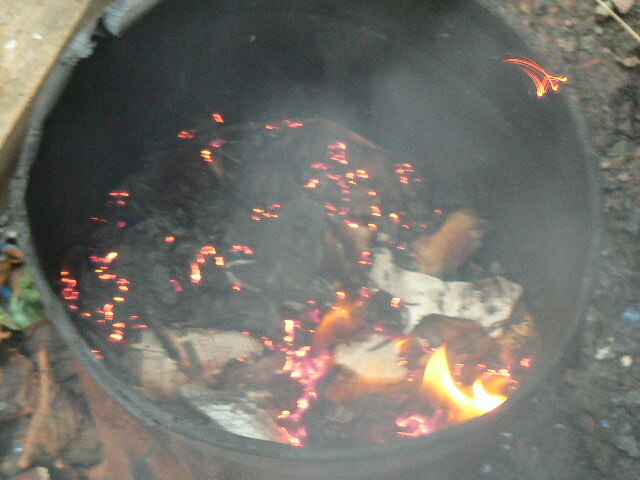 They are pretty grubby at this point, covered with charred newspaper and a silvery sort of residue left by the smoke. There is a little more involved if the pieces being fired are finished with glazes with copper or other “colourants”. Copper is often the glaze material that creates the lovely coppers (go figure), blues, greens, yellows, etc. that are associated with raku. After the pieces are taken out of the kiln (and I usually use the rapidly fired garbage can kiln for this) and put in the container, putting the lid on creates a reduction atmosphere, which cuts off the oxygen getting into the container. It is during this time that the colours are created. (I can’t really describe what happens chemically here…its very technical…and its pretty!) The colours are fairly delicate, and can fade, or re-oxidize when exposed to sunlight so I spray a clear sealant onto them after they are cleaned to help reduce this. I am constantly learning new things about the raku process and changing things slightly in an attempt to “perfect” the process. (I’ll never get there, but its fun and challenging to try). Uncovering the pieces after they’ve reduced in the newspaper can be really exciting, or disappointing, depending on the results. I have a degree in Archaeology and Sociology and Raku reminds me a bit of working on a dig. 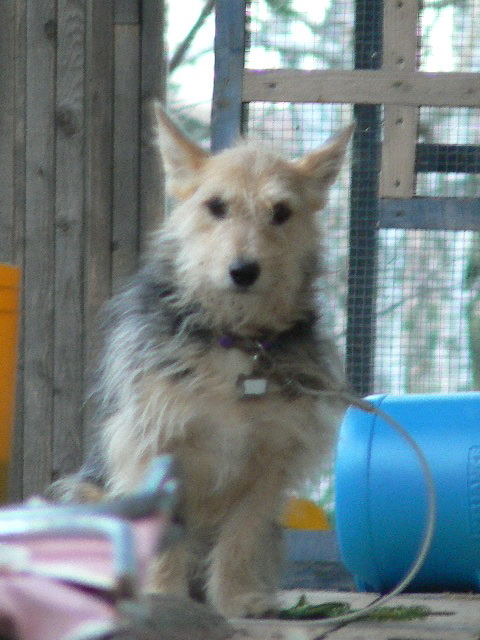 The potential to find something really exciting in the pit, or maybe just digging a hole and finding….dirt…but you keep doing it anyway because the next time could be the best. Thanks for reading…I hope this gives a basic idea of what the process involves. I’ve tried to gear it towards non-potters, so if you’re a potter and familiar with raku you’ll know that I’ve left a few things out to keep it simple. There’s lots more to it, but its sure hard to put into words! I’ve just been reading a bit of your blog – really interesting especially about the way you make the pieces. We have shipped a few of your pieces successfully now for various people so I am starting to really appreciate it now rather than have it strike fear into my packaging heart. We are also doing shipments for Wendy at GA and Deanie at Shape Shift – we have a leaflet which the customer fills in and we do the rest. I’m SO sorry we missed your shop. We were there bt you were not, I now know why :-). We saw a couple of concerts too & then traveled the cabot trail with our 2 dogs, We visit NS ever year taking turns between Shelburne & CB for Celtic Colours so we wll not be up your way for another 2 years :-(. I am sure I would’ve purchased a piece as they look wonderful on line. Do you have a catalog with prices? If not, I guess I’l have to find you in 2 years.